Recently, at the Aidy.com headquarters in Cambridge, a lively debate broke out over whether or not the 3.5” floppy disk was truly dead as a data storage format. Over the last few years it’s definitely taken a beating, starting with the first Apple Macs to be released without a floppy drive. Dell followed suit, then one by one the major high street names such as PC World and Staples stopped selling the ‘once revolutionary’ format. With a total storage capacity of 1.44Mb its hard to see how such a medium could find a place in today’s world of memory sticks, DVDs, CDs and external hard drives. Yet none of these formats seem to have the charm and aesthetic appeal of the traditional floppy disk. We watched over the years as this format changed in size both physically, and in capacity until it blossomed into the 3.5” disk that we grew to know and love. It seemed there was nothing that could beat that feeling of cracking open a brand new box of Maxell’s and lovingly labelling each and every one with the labels that had been thoughtfully provided. So what happens now? Do we let this monumental medium fade into technological obscurity? No! 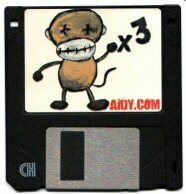 We here at Aidy.com are not prepared to see the 3.5” floppy go silently into the night. We feel we’ve found a way to breathe new life into the flagging format and today we’ll be releasing ‘3 Monkeys’ as a limited edition single on this very format! By getting the MP3 bit-rate right down we’ve managed to fit the entire song on one disk. Only 100 are to be produced but we really do feel like we’re starting a revolution and can see many other bands and artists following in our footsteps. In fact we whole-heartedly encourage other bands to do the same! Geek Pop are holding their third annual music festival Geek Pop Fest this coming weekend, and I've been fortunate enough to get a couple of songs into the line up! 3 Monkeys and a new one about Sir Clive Sinclair, simply called 'Sir Clive Sinclair'. I'll be releasing the latter this Friday along with another YouTube clip featuring a slightly knackered C5 that I purchased on Ebay. Well that's the first of month of the 'Song A Week' project done , just eleven to go now! It's been great from a creative point of view as I've now got a some completely new songs that didn't even exist until this year, and I've got a few tracks finished that have either been sitting in my head or in some state of half completion on my computer gathering dust. I'm particularly happy with 3 Monkeys, and the little synth bit at the end. Promotion wise, I seem to be doing okay this month, I've had an interview with a London radio station about the project and about music downloads in general, and the music video for Blood On My Hands (produced by Mike Kimberly) is now being rotated on Sky TV, so I'm pretty happy with how things are going. For some reason, I'm beginning to get more and more into the whole video blog side of things, and have even started to rope my friends into being in them, if you haven't seen any yet you can check them out at www.YouTube.com/AidyMusic where you'll also be able to watch Blood on my Hands. Well, it's nearly 2010 now, and I've created a couple ways for you to keep an eye on my 'Song A Week' project, if you want to join me on my little musical adventure each Friday throughout the year. Podcast If you wanna subscribe to this, it'll come out every Friday and contain a brief bit about that weeks song, possibly any other news I feel compelled to share with you and the song itself at the end. Check out the podcast here: http://www.aidy.com/podcastgen/ If you're using iTunes click here. Video Blog This is gonna be released fairly intermittently, and will give you a brief look behind the scenes of the project. "This is the first time I've heard of/from Adrian Killens and its been all my pleasure. The impression I get is of a bedroom enthusiast, a musician in exile, recording for pleasure and as part of a pre-determined daily practise. The production here is clearly that of a home recorder - working with the limitations and imperfections but leaving them listless and unimportant, such is the raw quality of some of the material here. Handpicked from previous demos and self-releases, Selected Demos brims with pop sensibility and starts with its best track, the quietly wonderful Prettyish. The record is a mish-mash of styles, from the Oasis-esque laddish roar of 22 to the Weezer-lite of It's Only A Drink, there is a lot to be commended amongst the anxious off-beat lyrics and hisses of the demo tape. Somewhere between 90's Brit Rock, Babybird and American grunge, this is a fine collection of tracks. I think Adrian would do well to spend some time in a real studio though; imagining these tracks played with the best equipment and with a better scope fills me with excitement. Great indie-pop with hushed vocals and bitter lyrics. Perfect for the wintery months. Download the album for free from: www.aidy.com"
So after the release of 'Selected Demos 2002-2009' I've been trying to work out what I'm actually gonna do next, and after some thought I've decided to take on a similar project to US solo artist Jonathan Coulton, if you don't know who he is then check him out here. Jonathan worked as a Software Developer until 2005 when he quit his day job and started a project called "Thing A Week" in which he released a new song every week via his website. That's exactly what I'm going to be doing. I'm not intending to quit my job though, I actually enjoy what I do for a living plus my time management skills and strong British work ethic mean I'm capable of holding down a day job AND being creative ;-).